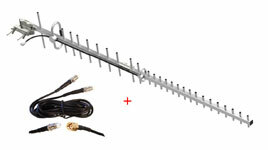 Description: The yagi antenna provides an advantage in weak signal areas or for repeater systems. This antenna is designed for use on stationary objects such as buildings. If this antenna is not aimed correctly it will lose its effectiveness. The 51" boom is the main part of the antenna and includes 28 elements constructed aluminum. The output coaxial connector is an FME Male type. The antenna's impedance is 50 ohm with a maximum power rating of 100W. Pipe mount hardware is included. Unique design, the main boom comes into two pieces to make package size in half, easy to carry and install.